How do you feel about early 1970s small displacement motorcycles? Something like, oh, a 1973 Honda CB100 or CB125? Any found thoughts/memories? Like many riders of a certain age, I started on very small, fat tire trail bikes and "graduated" to a small displacement motorcycle. Being a typical power/speed hungry youth, I quickly moved up the ladder through 250cc - 500cc - 750cc and landed at a six-cylinder Honda CBX in the 1980s. These days I find myself looking with interest at the small displacement machines being offered in the US market. Maybe I'm just getting tired of hauling an 800-pound motorcycle around town, maybe my motorcycle tastes are (gasp) maturing, I don't know. I just know that I really like bikes like the Suzuki TU250, Royal Enfield, and now the SYM Wolf Classic 150. 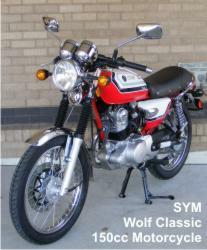 Looking at pictures of an early 1970s small Honda and a new 2012 SYM Wolf Classic, it's easy to see the resemblance. If you were one of the many, many riders of a small displacement Japanese motorcycle back in the day, I can tell you that the SYM Wolf Classic also "feels" like one of those wonderful little machines. Living here in the Twin Cities, you'd be forgiven for never having heard of SYM before. SYM is Sanyang Motors out of Taiwan. They've been around since 1961 and they build some of the highest quality motorcycles and scooters in the world. Based on first-person experience I can honestly say that some SYM products are the equal of anything from Japan so far as quality is concerned. In fact, SYM has been a manufacturer for Honda under license in Asia. So if they're so great, why haven't we seen them here in the USA? One word - distribution. OK, lets' make that two words - poor distribution. In January of 2006, SYM established an agreement with Carter Brothers for distribution of SYM products in the USA. Carter Brothers never really did anything with SYM. They had a few dealers and seemed to be gaining some ground, but they just couldn't take off the way other Taiwanese brands did (Kymco and PGO via Genuine in Chicago come to mind). In July of 2010, the Carter Brother warehouse was destroyed (along with the inventory) in a fire that was believed to have been caused by arson. After that came a dark period of little-to-no support and an annoying struggle to get parts from SYM of Canada. In April of 2011, Lance Powersports in California announced the formation of Alliance Powersports which would be the new USA SYM distributor. Since April, Alliance has been working to re-establish a parts supply and started to bring new product into the USA. One of those new products is the SYM Wolf Classic 150 motorcycle. 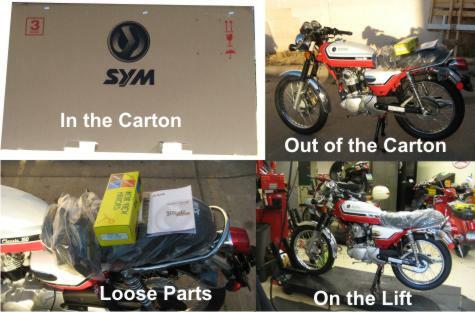 GoMoto is the Twin Cities dealer for SYM. A few years back BlueCat Motors in St. Paul was the SYM dealer, but they decided not to continue with any brand of new scooter sales. Alliance shipped the bike to Scooterville in Minneapolis with the gracious permission of Bob Hedstrom, the owner. At the time, GoMoto was in the process of moving to their new location on Washington Avenue. Marty from GoMoto came over after hours and we prepped the bike in the Scooterville shop. Yeah, we all need to take a minute and be thankful for guys like Bob and Marty. They are (technically) competitors, but they are scooter/motorcycle enthusiasts first. How many businesses would let someone work on a product they don't sell after hours? The bike came out of the carton, the battery was filled with acid and put on the charger, and the very few loose parts were installed. The quality of the Wolf Classic was already evident. The mirrors, side stand, foot pegs and battery needed to be installed. The battery provided is NOT a sealed, maintenance-free battery as one might expect, but a pretty cheap conventional type. The front and rear turn signals are in ugly black plastic housings that also look cheap. Everything else on the SYM Wolf Classic is so nice and of such good quality that these couple of small things stand out. The prep didn't take long, and the Wolf Classic was on the road. 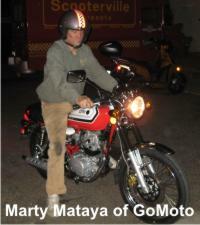 Marty from GoMoto had a spin and pronounced the bike a lot of fun. His first comments were all about the chassis and how sweet it was. This turned out to be a common theme when experienced riders had a spin on the Wolf. Marty had to head home to dog-sit and I road back to St. Paul. The inaugural ride was wonderful. I felt like a seventeen-year-old coming home after working a late shift at the pizza parlor. My GPS went on the bike the next morning to begin some real testing. 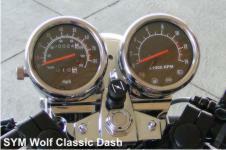 The SYM Wolf Classic speedometer reads about 5% optimistic. An indicated 61 MPH is actually 58 MPH. The odometer was also slightly optimistic with 10.4 miles indicated being 10.0 miles in actuality. I consider these good numbers. Most motorcycles and scooters that I test are more optimistic than this with 10% being average and some off by as much as 20%. This was a brand new bike, not yet broken in, so I didn't search the upper limits of performance. I did see an honest 62 MPH on the GPS (66 MPG indicated on the speedo) and I would expect that a smaller rider (I'm 220 pounds) after break in would do a bit better than that. In over 100 miles of riding I averaged 85 MPG which is EXCELLENT fuel economy and would likely get even better after break-in. The SYM Wolf Classic is a 150cc (149.4, close enough) overhead cam 4-stroke that has a claimed output of 14.7 horses. This is not a fast bike by any means. 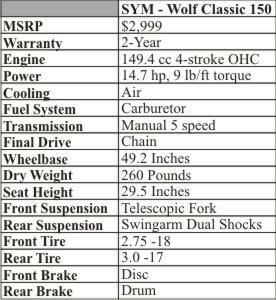 At $2,999 I was hoping for fuel injection. The MSRP on the Suzuki TU250 which IS injected is $3,999 - but it's a 250 and a Suzuki which is an infinitely more recognized brand in the USA than SYM. Still, the SYM engine is a real sweetheart. It features the latest ceramic cylinder coating which should help with heat and wear resistance. The transmission is a 5-speed and shifts in the conventional manner (1 down, 2,3,4,5 up) with a chain final drive. A telescopic fork in the front and a couple of shocks in the rear handle suspension duty and the bike rides on an 18 incher up front with a 17 in the rear. The fuel tank holds a little over 3 gallons. I'd strongly suggest non-oxygenated fuel as this is a carbureted bike. The controls and switches are conventional with another minor complaint. The turn signal switch is NOT of the push-to-cancel variety but is a rocker with left, center (off) and right positions. 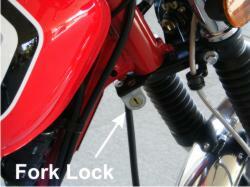 The fork lock is not on the main ignition switch but is down on the right side. The Wolf Classic comes equipped with both push-button electric start and kick starter. The bike kick starts pretty easily, though the starter lever tended to bind on the exhaust shield on the upward swing. Lighting is very nice with a bright H4 halogen headlight. The dash includes pods for the speedometer and a tachometer. Going back to our early 1970s bikes, the tach was not usually provided on those bikes. The speedo is to the left, biased to miles-per-hour, with the odometer (in miles) above the center of the gauge and a trip meter below. The knob to the left of the pod resets the trip meter. The manual choke and 2-position ignition switch are in the middle and the tachometer and warning lights are in the pod to the right. There is no fuel gauge and no fuel petcock, but there is a low fuel warning light. The conventional specifications of the SYM Wolf Classic don't really do justice to how exceptionally nice this bike is to ride. As Marty stated right away, this is one sweet chassis. The light weight (of the bike, not me) have a lot to do with this, but it's also the combination of quality components and skilled manufacture that bring it all together. Handling is crisp and precise. Braking is strong and easy to modulate. The transmission upshifts like a dream. Gear spacing is a little odd, there isn't much of a ratio different between 3rd and 4th. Think of 4th as an overdrive for 3rd and it makes more sense. Downshifts were fairly vague, and the Wolf Classic doesn't like stacked downshifts (4,3,2 all at once without letting the clutch out) but this may improve as some miles are put on the bike. The seating position favors those of shorter leg. With a 30 inch inseam I was very comfortable. Everyone who saw the SYM Wolf Classic wanted to ride it. The ergonomics are really good and cover a wide range of people. The clip-ons aren't too low or too far forward and even with the short seat height riders a bit over 6 feet were OK with the position. I stopped by BlueCat Motors in St. Paul where they work on vintage bikes all the time. Ryan the owner and all the guys in the shop took it for a spin and all came back with a big grin on their faces. Overall, over a dozen people rode the Wolf Classic and all had positive comments, mostly about the ride and handling. The Wolf Classic does come equipped with foot pegs for a passenger. I'd take them off and throw them away (not really, they'd sit in a box in my garage forever). The seat is also set up for solo riding. I did take a couple of people on the back and nobody complained, but those were SHORT rides and I'm pretty sure that longer jaunts would have solicited some whining. At first glance, the SYM Wolf Classic seems like an expensive toy. At $3,000 and with only 150 cc what else could it be? After spending several days riding it, the Wolf Classic seems reasonable to me. It's just about a perfect urban bike. It's light, nimble, fast enough for brief runs on urban highways, gets great fuel economy, and will likely be cheap to insure and maintain. It's also really, really good-looking and draws attention everywhere it goes. Whenever I parked or stopped to gas up people would come wondering over and ask me about the bike. I sincerely hope that Alliance Powersports can rebuild the SYM dealer network in the USA so we can continue to enjoy fine machines like the SYM Wolf Classic. The SYM Wolf Classic 150cc motorcycle continues to build a following in the US market. A good quality, small displacement, cool-looking and FUN motorcycle actually selling in this country? 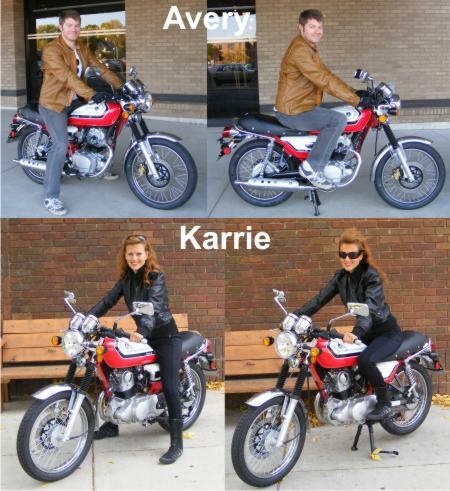 North Americans starting to "get" what great machines small displacement bikes can be? What could be better! How about more colours to choose from. In addition to the two-tone shown in this article and the sold green, white, black and red are now available.